It can be difficult to stand out in the fast paced world of social media, but having a well branded cohesive design across your social profiles can help differentiate your business from the masses. Doing so will help reinforce your brand with existing customers and give a fantastic first impression to new prospects. We just finished a complete social media profile redesign across all of our channels and we are thrilled with the results. Here are five tips to help your business do the same. 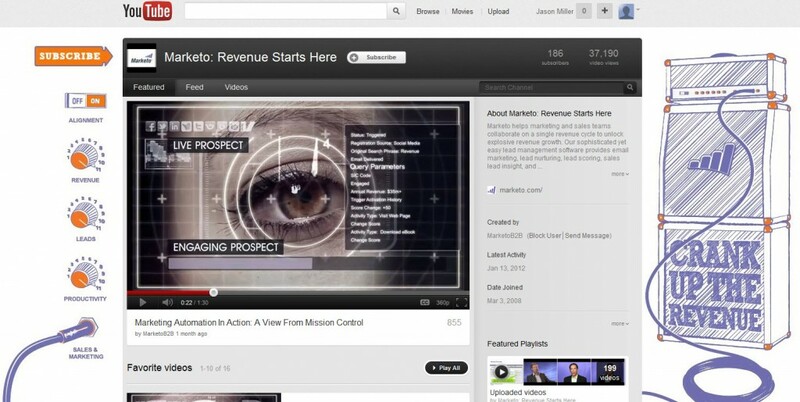 Have a running theme – It’s a good idea to unify your social profiles with a good running theme. 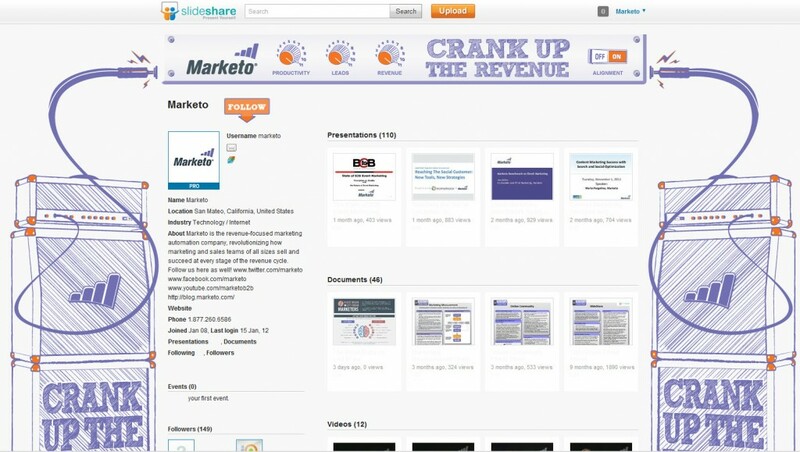 Since Marketo’s software helps you increase your revenue, among other things, we decided to go with the theme of “Crank up the Revenue.” It’s the perfect extension of our Revenue Rockstar program to the social-sphere. Keep it playful and fun – Social is about not taking yourself too seriously. Your profiles should reflect this and have a sense of playfulness to them. Taking a note from the classic film, Spinal Tap, our new profiles showcase this idea because we turn your revenue up to eleven, it’s one louder. Use colors from your website – When designing your social profiles; keep in mind the colors from your website. If you incorporate these colors it’s much easier for visitors to relate to your overall brand and feel. 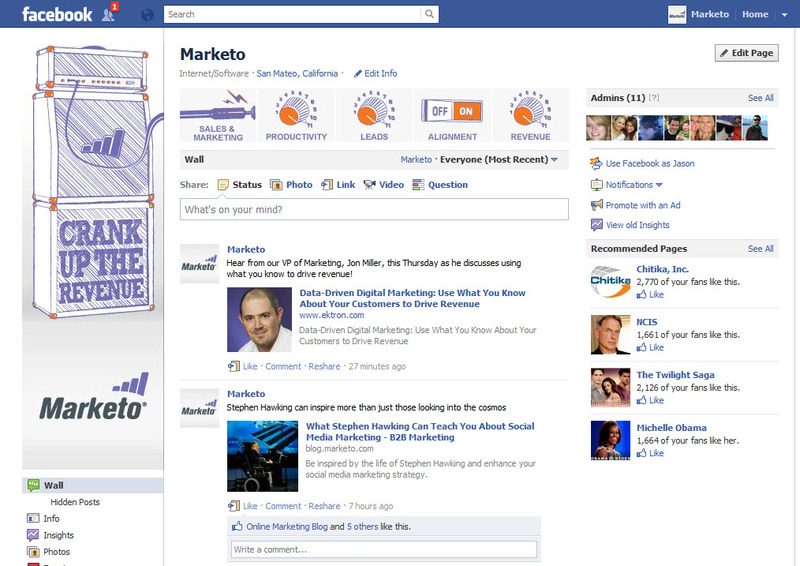 We focused on purple, grey, and orange, colors that are synonymous with Marketo. Get a professional – Although it’s simple to design a basic profile, if you really want to take it up a notch, hire a professional. Select an agency to guide you through the maze of custom sizes, optimal resolutions, and illustrations. We found a boutique agency and discussed our vision with them. 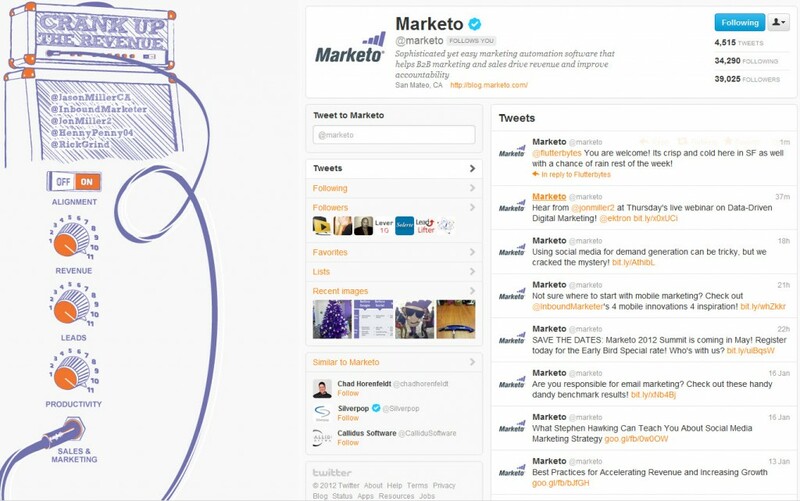 Along with our style guide and a crash course in Marketo culture, they turned our ideas into reality. Connect the online with the offline – A good agency will deliver your new social profile images as vector files. Vector files are created by graphic designers so that logos and other images can be easily converted to a wide range of sizes without distorting the image. This means you can utilize your new designs for trade show props, business cards, or even on a billboard without losing image quality. What do your social profiles say about your business? Are they unified with your overall brand? Have any tips to add?